Contains NO alcohol and NO sugar. The packet becomes your cup. The best alternative when you don't have time to brush. 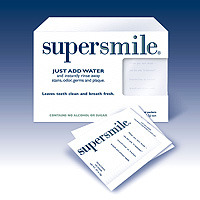 World's first patented mouthrinse to dissolve plaque and attack odor-causing bacteria. Swirl and rinse! Perfect for travel, after a meal, before a date. Mouthwash for when you cannot brush. On a date, before a meeting, on a plane... Our whitening mouthwash will give you the same smooth feeling as Supersmile tooth whitening toothpaste, and it will brighten teeth by removing plaque. Our tooth whitening mouthwash is the only one you can carry with you in your pocket. It is the size of a credit card, and the package becomes your cup. You just add water, rinse and throw away.